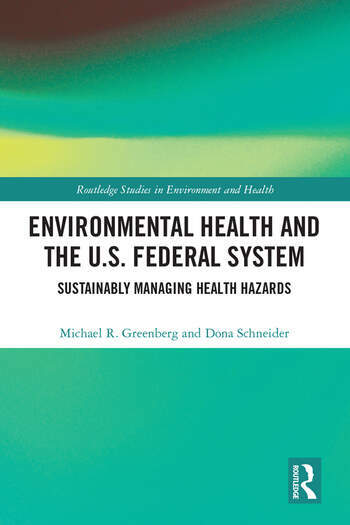 This book explains how the U.S. federal system manages environmental health issues, with a unique focus on risk management and human health outcomes. Building on a generic approach for understanding human health risk, this book shows how federalism has evolved in response to environmental health problems, political and ideological variations in Washington D.C, as well as in-state and local governments. It examines laws, rules and regulations, showing how they stretch or fail to adapt to environmental health challenges. Emphasis is placed on human health and safety risk and how decisions have been influenced by environmental health information. The authors review different forms of federalism, and analyse how it has had to adapt to ever evolving environmental health hazards, such as global climate change, nanomaterials, nuclear waste, fresh air and water, as well as examining the impact of robotics and artificial intelligence on worker environmental health. They demonstrate the process for assessing hazard information and the process for federalism risk management, and subsequently arguing that human health and safety should receive greater attention. This book will be essential reading for students and scholars working on environmental health and environmental policy, particularly from a public health, and risk management viewpoint, in addition to practitioners and policymakers involved in environmental management and public policy. Michael Greenberg is Distinguished Professor at the Edward J. Bloustein School of Planning and Public Policy, Rutgers University, USA. Dona Schneider is Professor and associate dean for programs at the Edward J. Bloustein School of Public Policy, Rutgers University, USA.